Details about the installation of the auditorium chairs, there are a lot of place need our attention. 1, confirm the length and width. This is the most important basic data. Confirm the number of sites within the channel (straight, horizontal a few), the width of the reserved channel (small synagogue channel is in commonly 120 centimeters, is generally not less than 100 cm, in the great hall of the 180 cm, generally not less than 150 cm). 1) calculate the amount of each row of chairs, with total width minus the reserved channel width, the data calculated by dividing the chair width, rounded, is the number of each row of chairs. 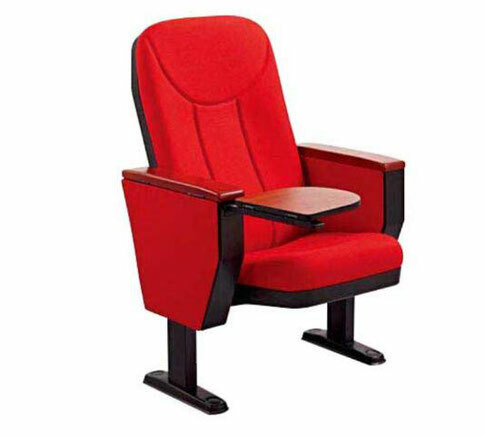 (domestic each auditorium seats in the standard width of the focal distance is 57 cm, both: chair 49 cm wide, with a handrail 8 cm wide. According to the requirement of the customer chair can be adjusted within 55 to 59 cm wide).